Please select the size of the hard drive you would like installed inside your DVR Recorder. Powerful yet compact 8 Channel DVR that offers more features than our 8 Channel Tribrid DVR NVR Recorder but at half the price. It has the same exact processor and Linux OS that allows high quality 1080P video recording. The only feature that it does not have compared to its larger sibling is the capacity to hold 8 hard drives; this DVR can support up to 1 drive for a total of 6TB of storage. This DVR also supports an additional 4 IP cameras, making it effectively a 12 Channel DVR. You can choose compatible HDCVI and IP cameras from our offerings. The 8 BNC ports are for connecting hdcvi or analog cameras, while ip cameras can be connected over your network. There are also 8 audio inputs that allow audio to be recorded and synched with video from each of the first eight cameras. There are 2 video outputs, HDMI, and VGA so you can operate two different monitors simultaneously. Hooking up a big screen HD TV is easy with the 1080P HDMI connector. This HDCVI / IP / Analog Camera Tribrid DVR is truly the state-of-the-art in security DVR technology. It has a powerful dual core embedded processor, and runs on a Linux operating system with easy to use point & click interface. This is NOT a PC based DVR which is subject to viruses and hacking. This is a standalone DVR built for only one purpose - to be the most reliable surveillance video recorder in the world in its price range. All of our DVRs utilize H.264 hardware based video encoding to bring great quality video while maximizing hard disk storage capacity. Accessing the DVR from the internet is easy. Simply connect the DVR to a broadband internet connection. The built-in Web server allows you to perform almost every function of the DVR remotely with Internet Explorer or Mozilla Firefox browsers. Free Central Management Software (CMS) is also included to allow you to centrally manage multiple DVRs or NVRs from CCTV Camera World simultaneously. Two-way audio over the network or Internet is also standard. So, not only can you hear what is going on, you can interact. This DVR supports up to 10 simultaneous remote users. With Dynamic DNS (DDNS) support, it is not necessary to have a static IP address on your network in order to remotely access this DVR. This saves you money, as most ISPs charge extra for a static IP address. Having the ability to remotely view your system is great, but what if you are on the road and just can't monitor your system all the time. This is no problem with our DVRs highly flexible email and push notification capability. Just set up a standard POP email account like GMAIL and configure the system email you anywhere based on any criteria you choose. Many of our customers have alerts sent to their mobile devices for real time alerts. All of our DVRs offer FREE Apps for remote viewing via a number of popular smartphones and tablets. Video can be easily downloaded from the DVR to a external hard drive or flash drive using the USB port. You can even download video directly to your Windows or MAC computer using our CMS software. If you worry about losing valuable footage in case of hardware failure or the DVR being stolen, video can be automatically uploaded by FTP to a server or NAS. You can even use one of our 8 channel NVRs as a live backup server to mirror the DVR using its RTSP stream and record video offsite. (1) RJ45 Network Port - for connecting network cable to router. IP cameras connect through network. This 8 Channel DVR is compatible with both Analog Security Cameras and HDCVI HD Over Coax Cameras on each channel, and up to 4 IP cameras (max 5MP) for a max of 12 channels. Can it record 8 audio? and can hear through the iphone? 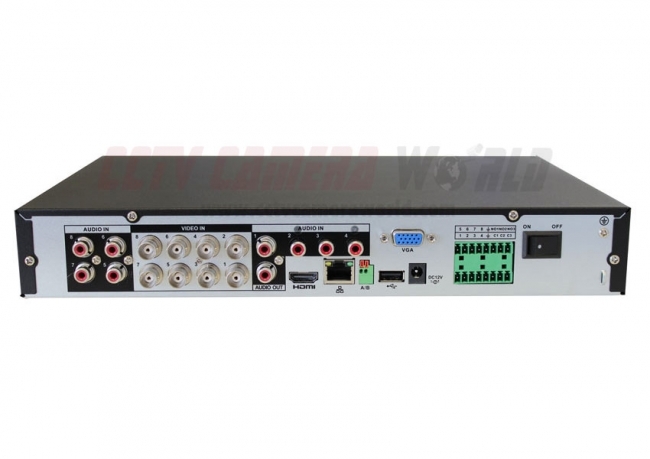 Yes this DVR can record up to 8 audio inputs as described in the product description. You can use this security camera with built-in microphone using the HDCVI protocol to send audio over a HD siamese cable. Sending audio over HDCVI does not require use of the additional audio ports built-in the DVR. If you are using analog cameras, you will need to use a separate security camera microphone and wire it using a security camera cable with audio connector. Can this camera be hooked directly to a TV for live viewing, no recording. Plan on using a RCA adapter. This security camera uses HDCVI technology. You can read more about it here: What is HDCVI?. To decode the high definition video signal and audio, you will need a HDCVI DVR or Tribrid DVR. This 8 channel DVR comes with a 12V DC 2amp power supply that is sufficient to power the DVR. Cameras must be powered a power distribution box. You can learn more about our best internet security camera remote viewing apps here. Does the compression H264 used in this DVR also record the audio for playback? Yes this DVR records audio inputs synced with the video inputs using H.264 encoding.